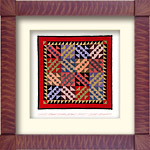 These unique Folk Art collectibles are the product of many years of research into the quilts, quilt making traditions and quilt makers of the 19th and early 20th century. Designs are created with these early pieces in mind and then carefully adapted to 1"= 1' (1:12) scale. Many hours are involved in the drafting, fabric selection, cutting and making of the initial piece. This accomplished, quilts are then recreated using antique fabrics, as one of a kind or in limited editions of two to ten pieces. Other techniques used in construction include stenciling, hand appliqué and ink embellishment. Finding appropriate antique fabric for use in making the quilts is an elusive pursuit, for one never knows when or where that perfect scrap will appear. There is also the dilemma of what should be used and what should be preserved in its current state. To take apart antique quilts, clothing or other historically important textiles would be unthinkable as well as impractical. Fabrics used in the quilts range from small snips to pieces measuring a yard or more in length. These are gleaned from the scrap bags of early quilt makers and seamstresses and are found at estate sales, farm auctions and antiques stores. Such finds are treasures, affording the chance to accumulate a selection of fabrics from which to work. Working in 1:12 scale allows for the use of the smallest of pieces, given that most blocks measure a mere 1/4" square. Like the early quilt makers I preserve each scrap, perusing my collection until the perfect combination emerges. 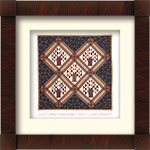 Scarcity is the central design element, affording the quilts an undeniable character. Flaws in the fabric, signs of wear and mending are apparent. With the use of antique fabrics and early patterns and designs, I hope to create quilts that are truly reflective of the Art of Traditional American Quilt Making.